Huts visited: Paua Hut (2 nights), Baine Iti Hut (0 nights), and a whole lot of private batches that don’t count. 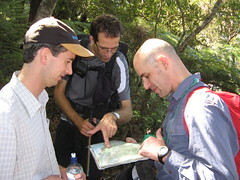 This was a weekend Easy-Medium club trip into the Rimutakas, roughly east of Wellington. After driving to the Catchpool Valley road-end in a couple of cars, we walked for a couple of hours in the dark towards Paua Hut, with some interesting crossings around the braided (and very shallow) Orongorongo River towards the end. Having reached the hut, we sat around for a little while, and went to bed. On Saturday, Paul was keen to do some off-track exploration, and for this we decided to walk a little down the river to the intersection opposite Oaks Hut, before bashing up the spur onto the ridge south-west of the Turere Stream. It turned out that there are actually trap-laying tracks around a lot of this region, and one of them went straight along this ridge-line. We followed it for some distance, before deciding to bash down the hillside to try and find the Turere Stream at the bottom for lunch. There was one particular major spur that we were aiming for on the map, but we later discovered that we’d missed it by quite a lot. In fact, we hadn’t even reached it, and ended up having to sidle around a very steep hillside for quite some distance looking for a safe way down, all the time without much to hold onto. It was quite an interesting experience, and for me I think the adrenalin was rushing even more after the accident I’d survived a week before. We did eventually make it down, however, and had a relaxing lunch sitting on rocks at the river level, below a landslip that wasn’t marked on the map (as with many slips). After lunch, we bashed up the spur on the opposite side of the Turere Stream, up what turned out to be another trap-laying route, eventually arriving at the McKerrow Track along the ridge at the top. On hitting the intersection we’d turned left and hoped to find the post that marked the top of Mt McKerrow, but we never actually arrived at it. We later figured out that we’d actually come up on the other side of the peak than what we’d though, an had come up an entirely different spur that was further south-west of where we’d thought we were. This caught me by surprise because I’d had my compass out for the whole distance, and although there was nothing to take bearings from with the dense trees in the way, it still appeared we’d been travelling in the right directions and turning at the correct times. On studying the map again afterwards though, it turned out that the spur we’d actually walked up had very similar contours. In fact, we’d always been further south-west of where we thought we were, right back to when we bashed down from the top of the opposite ridge. I think I learned something through this experience, and hopefully I’ll look for that sort of thing a bit more in the future. Having found the McKerrow Track, we followed it back to the main junction at the Orongorongo River, then back to Paua Hut. Baine Iti Hut isn’t a DOC hut, and is owned privately, but it’s provided as a hut open to be used by anyone who wants to use it, which is really neat… especially with the apparent culture in the Rimutakas of having so many private batches. Following lunch, we had a leisurely walk back to the Catchpool Valley parking area. The Rimutakas are quite a weird place to go tramping, compared with other places in the New Zealand back-country, if only because the Orongorongo River is full of what are essentially people’s private batches, built before there were regulations preventing people from building on conservation land. This makes it very accessible, especially with the 4WD tracks, and it’s a bit of a different experience. It was a great weekend, though. 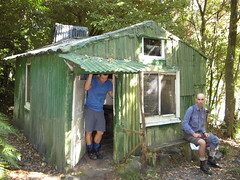 This entry was posted in tramping and tagged bagged:baine iti hut, bagged:paua hut, navigation, rimutakas, tramping, wellington tramping and mountaineering club. Bookmark the permalink.